This post is sponsored by Needham Lane. All product opinions are mine alone. Last weekend, Mike and I had one of our favorite weekends of the year: my non-profit's gala out on Kiawah Island. For working all day Friday at the event, my boss is always kind enough to let us stay at The Sanctuary Hotel for the weekend. We enjoyed dinner at The Atlantic Room, went to Chesson's art show, played disc golf, walked the beach, and, of course, relaxed at The Sanctuary. I absolutely love that place. The rooms are so welcoming, warm, and airy. 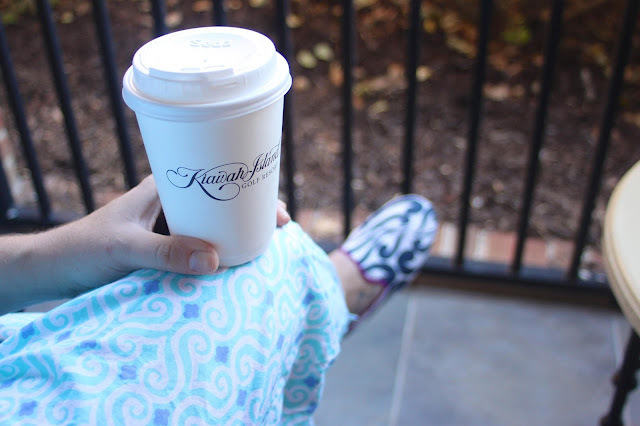 When packing for the weekend, I made sure to include my new favorite pajamas and slippers from Needham Lane. Dan and Maura are a fantastic husband and wife-led company based in New England, that has been making sleepwear since 2004. Maura was an art major, graphic designer and now creates all of the patterns herself! 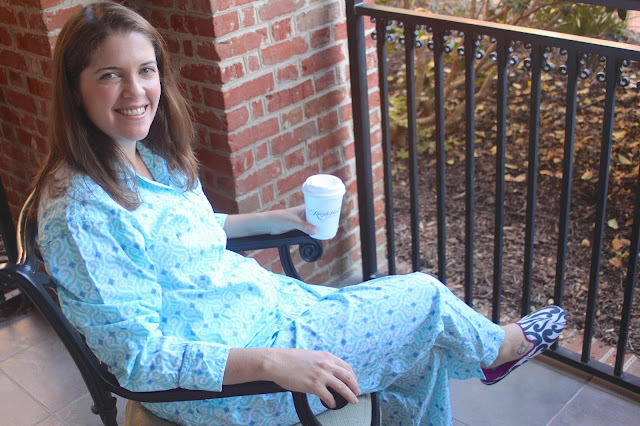 Gradually, they've taken Maura's lovely designs to the street by adding dresses, skirts, tunics, and shirts, and I was so excited when they contacted me to share their line of pajamas and brand new slippers! 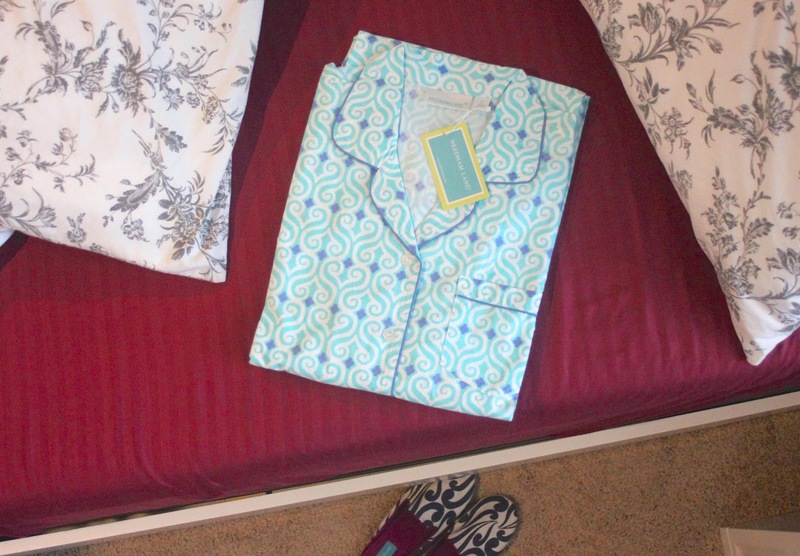 I chose the Ellie Seafoam Long Sleeve Pajamas and Isabella Navy Canvas Slippers, because the patterns immediately caught my eye. All sleepwear is made from 100% natural cotton from India and is cool, soft, and comfortable. The private patios outside each room at The Sanctuary are so calming and the best place to enjoy your morning coffee while listening to the waves. 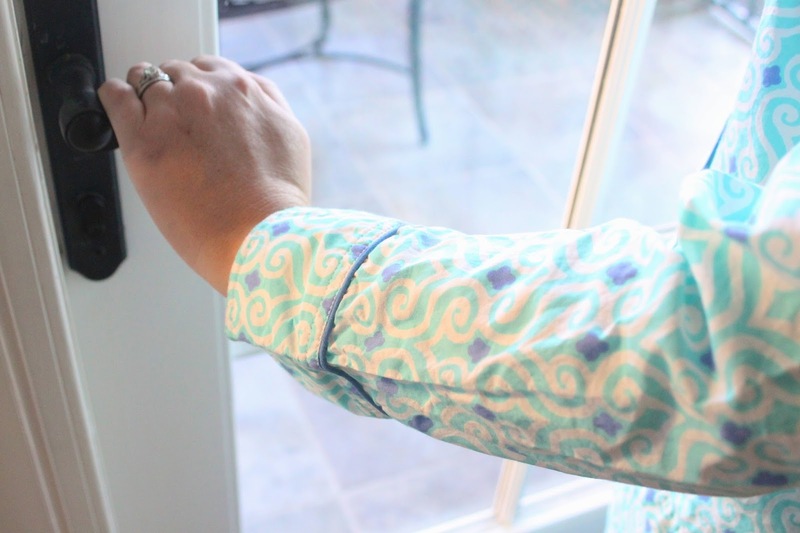 The weather was absolutely beautiful and in the low 60s each morning - just right for pjs! It was the ideal weekend of relaxation before all of the Thanksgiving madness begins today! After you eat all that turkey and are lounging on the couch, make sure you check out Needham Lane, and imagine yourself in the most comfortable pajamas this Christmas! If you're looking for holiday gifts, how great would a beach tote or scarf be for a gift this year!? Head to their website and join their mailing list to get 20% off your first order AND use the code 25THANKS to get 25% off all regularly priced items this Black Friday! I was just thinking I want to add a cute PJ set to my Christmas wish list and this sounds fab! Going to check their site out now :)!